January 10, 2016 By Elizabeth Lindemann 68 Comments / This post may contain affiliate links. Well guys, I’m almost a third of the way through the Whole30. And I have to say- I actually don’t want it to end! I feel GREAT. Not only have I noticed numerous health/physical changes, but I haven’t been this excited about cooking in a while. I’m cooking with ingredients I haven’t really used before, and finding super creative ways to make classic recipes to stay within the guidelines of the Whole30. Which brings me to my recipe for this post. Ever had stuffed cabbage? It’s one of those delicious, simple tasting dishes that is oh-so-comforting. But it’s often NOT a simple process to make: it requires blanching pieces of cabbage, filling them with a mixture of beef and rice, rolling them like enchiladas, and baking. It can take a very long time to prep as well as cook. This Spicy Stuffed Cabbage Casserole takes only FIVE MINUTES OF PREP. It’s a hassle-free way to get the awesome homemade taste of stuffed cabbage, but your slow cooker does all the work. No rolling, no blanching… just mix some things together and turn on! Let’s talk about cauliflower rice for a minute. If you’ve been on Pinterest in the last few months, chances are you’ve seen something about this latest grain-free substitute for rice. And I have to say… it’s pretty darn good! The taste of cauliflower is neutral enough that it can mimic rice in texture for many dishes, without overpowering the flavor. I made burrito bowls the other night with my smoky Mexican pulled chicken over cauliflower rice, and it was awesome! And since I made a bunch over the weekend, all I had to do was reheat it for burrito bowls and use the rest in this stuffed cabbage casserole recipe. Here’s a great on how to make your own cauliflower rice. This recipe is as simple as it comes: both in the way it’s made and in taste. I love dishes that pack a big punch of flavor, but I also like very simple comfort foods, like this casserole. 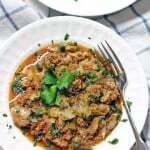 It has the consistency of chili (and in my opinion, is best eaten with a spoon) and simple Italian flavors from the garlic, Italian seasoning, and fresh parsley added at the end. It’s a wee bit spicy from crushed red pepper- but if spicy isn’t your thing, you can certainly omit it. And the best part? This recipe makes a TON. On thing I’m finding on Whole30 is that I need much less food in order to be satisfied. This is because the food that you do eat is extremely nutrient-dense. We ate this for dinner, for lunch the next day, AND I have a good amount in my freezer just waiting for a night that I’m too busy to cook. Go heavy on the salt. Because the ingredients are somewhat bland and simple, you’ll need a lot of salt to season it. When you mix the ingredients together, you may need to use your hands. Since there are so many ingredients, and very little liquid, it will be hard to stir with a spoon. Make sure you add the fresh parsley at the end and not before cooking. Fresh herbs are almost always added toward the end of recipes, so their flavor is stronger and brighter. And finally, if you aren’t on a dairy free diet, I believe this would be AMAZING with some mozzarella cheese melted on top. Just add it on top of the casserole after its done cooking and place the cover back on, and let it melt for a few minutes before serving! Sigh. I do miss cheese. 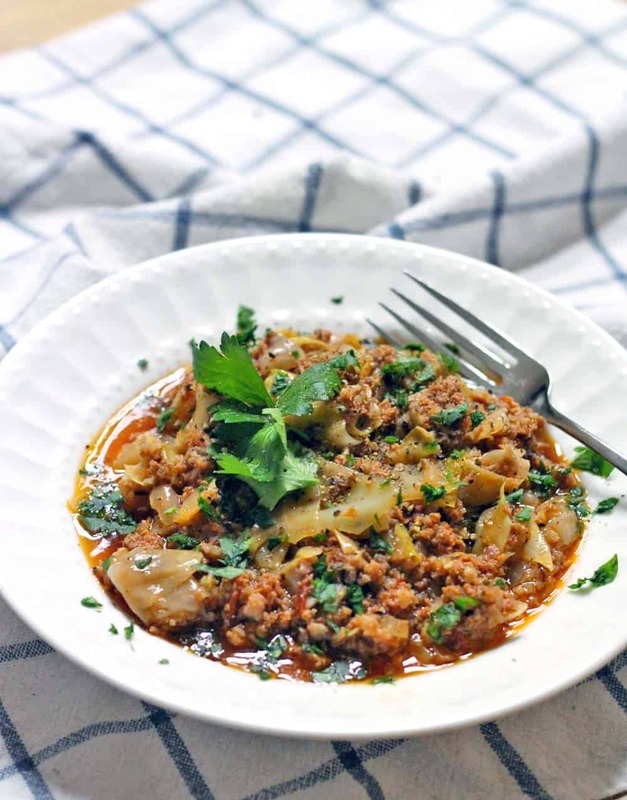 This slow cooker stuffed cabbage casserole tastes just like stuffed cabbage, but SO MUCH SIMPLER to make! Just mix in your slow cooker and turn on. Plus, it's Whole30 and Paleo approved! Stir together all ingredients except fresh parsley in a 7-8 quart slow cooker, making sure it's well combined. Cook on low for 7-8 hours or high for 3.5-4 hours, or until beef is fully cooked. You can use frozen cauliflower rice or pulse raw cauliflower florets in your food processor until it resembles the texture of rice. Brown rice can also be used if you are not following a grain-free diet. Use 1 cup of uncooked rice and add 2 cups of chicken broth, veggie broth, or water to the casserole before cooking. Freeze leftovers in an airtight container for up to 6 months. If you are using a very lean ground beef, I recommend adding just a little bit of liquid to the casserole- just a half cup of water, chicken broth, or veggie broth. Optional: add mozzarella cheese! Just add it on top of the casserole after its done cooking and place the cover back on, and let it melt for a few minutes before serving. Hi. I’m making this right now. Question…Did you stir this frequently? I know you are not supposed to open the lid for slow cooker cooking, but for cabbage, I would guess that this cooks down and softens from the bottom of the cooker, upwards. I’m tempted to stir this every couple of hours to make sure it cooks down (cabbage softens) evenly. No need to stir! Just stir it at the end when it’s finished ???? hope you like it! Lets see. 2# ground turkey, fried, 1 large head Cabbage, 1 head Cauliflower, 1 Green Pepper, 3 Onions, 1 large can Tomato Puree, 1 can Diced Tomatoes, and a few other things. I had enough to fill my 8 Qt. and my 6 Qt. to the top. It cooked in 6-1/2 hrs. Very soggy. My Wife strained everything. But, its great! Go;s with mashed potatoes. Will make this again. If I swap out beef with turkey, do you think any other modifications would be needed? Hm, I think the only thing is that it might take a bit less time to cook- since turkey is leaner, it will overcook faster. Maybe just check on it a little earlier. Other than that, I think you’d be good to go! Loved this! Your mozzarella comment inspired me to add a tablespoon of compliant mayo to make it creamier. Also added a splash of Frank’s Red Hot to make it spicier. Yum Yum! Stupid question…..but, I assume you cook the ground beef first, right? I’ve never just tossed raw ground beef in a slow cooker before. Nope, just add it raw! I promise it will cook all the way. That’s what makes this recipe super easy. Sorry for the delayed response! I’m in the (very slow) process of updating my recipes to include nutrition information. I went ahead and updated this post, thanks to your question, with the info. Looks like it’s about 18 g. carbs. Hope that helps! So glad you liked it! 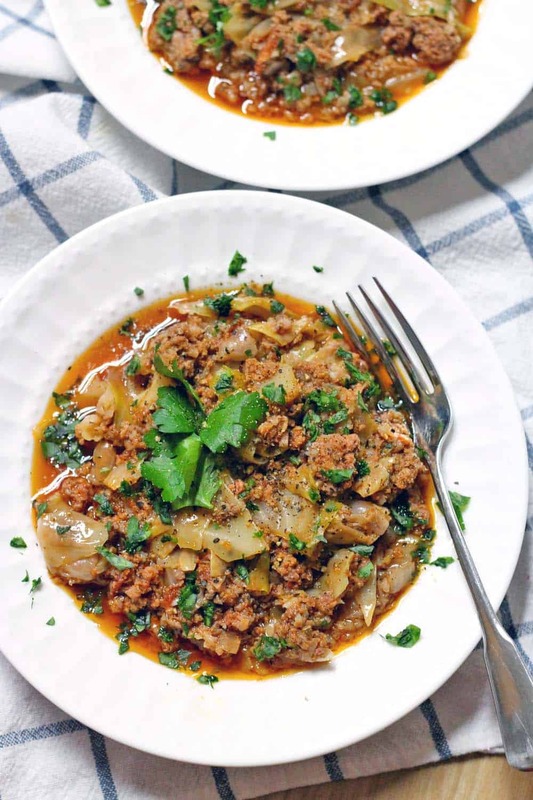 I agree about the browning ground meat thing- but when I’m in a hurry, in certain recipes with lots of other flavors and textures, I feel that it doesn’t make much of a difference anyway (so I skip it to make my life easier). Thanks for the comment, and I LOVE your suggestions, especially the pureed butternut squash! How long would I cook in Instant Pot? thank you! So, I’ve never tried it in the IP, but you’re in luck- another reader commented how she made it in the instant pot in the comment right above yours! I’ll add it to my to do list to add the instructions in the note on the recipe card, too. Hope this helps! thank you!! i saw that just after I posted… didn’t mean to add double work. appreciate it! Hello Elizabeth – thanks for an amazing recipe! I combined yours with another I found for an Instant Pot to sort of figure out the cook-times and all that. It yielded AMAZING delicious results, so I thought I’d share with you and your other readers. I used the “Saute” mode to brown the ground beef for about 5 minutes, sprinkled with a lot of salt & pepper. After it was cooked through, I added ALL the other ingredients EXCEPT the cabbage and cauli rice. Pressure Cook on “High” for 15 minutes. Then, I released the steam and all that, opened ‘er back up and added a packet of pre-shredded Cabbage from Trader Joe’s and a frozen pack of Cauli Rice. I did not mix the ingredients, so the cabbage sat on top of the juicy mixture, instead of mixed through. Pressure Cook on “High” for another 3 minutes. It came out incredibly juicy & mouth-watering delish! I ended up adding about a 1/4 – 1/2 cup of Whole30 Compliant marinara sauce at the end just to add some more tomato flavor. Because of the shredded cabbage, the consistency came out a bit more like bolognese sauce and I can’t wait to pour the leftovers on top of zoodles or spaghetti squash. Oh shoot! I forgot to mention that I added some bone broth to the initial Pressure Cook for some liquid yumminess. It didn’t come out too watery and retained all the amazing flavor! THANK YOU for sharing this! It’s been on my to do list to try and figure out how to do this in the IP, and I’m so excited you already experimented with it! Definitely trying this next time I make this. I made this today and love it. I have an Instant Pot arriving tomorrow and will try it in there next time! So happy you liked it! I need to try this in my IP too. I know you’ve answered a lot of questions about frozen cauliflower; here’s one more…can I dump it in frozen (will that add too much water), or should I thaw it first? Can’t wait to try this. Good question! I’m honestly not sure. But my instincts are telling me to thaw it first- there is already so much liquid from the cabbage (and honestly, this recipe comes out more like a “stew” rather than a casserole because of it). If you forget to thaw it first, you could also uncover your slow cooker and keep it on for the last half hour or so, so some of the liquid evaporates. Hope that helps, and hope you like it! I just wanted to let you know that the stove-top version worked great! I took your tip of sautéing the onions and garlic. I added mushrooms to the dish and cooked them then too. It was delicious! Thanks again! Is it possible to convert this recipe for the stove top? I’ve made it in the crockpot and it turned out fabulous, but I don’t currently have one. So glad you liked it! You can definitely make this on your stovetop. The easy way is to just combine all of the ingredients (except parsley) in a large pot, bring to a boil, then turn the heat to low, cover, and simmer for… probably about an hour? Or until meat is fully cooked. Then add parsley, just like the slow cooker directions. If you want to get a little fancier, you can sauté the onions and garlic in the ghee before adding everything else, which will enhance the flavor a little bit. I’m making this this weekend. One more question. “Prepared” Cauliflower Rice. What does “Prepared” mean? I’m planning on using a bag of frozen Cauliflower Rice since it has to cook for 7-8 hrs. Just using them frozen. Does “Prepared” mean I should cook the Cauliflower first? What size Slow Cooker? I hate recipes with no size mentioned. I usually try for a small Slow Cooker then end up dumping it into a larger one. Whats 1/2 head of cabbage?…1 lb? 2 lb? Can you guess how many cups 1/2 head shredded is? Would Petite Diced tomatoes work better than crushed? Can we use ground turkey instead ? I’m really looking forward to cooking this recipe. Quick question, how many servings is this recipe? I’m looking to make lunch for a group of 10 people and wondering if I need to double it up or not. Hi Tamara! I would definitely double the recipe for 10 people, if it will fit in your slow cooker. If it looks like it’s going to be tight, I’d recommend doubling the meat and spices, and adding as much cabbage as you can (it takes up a lot of room in the beginning, but shrinks down as it cooks). You could also consider cooking cauliflower rice (or regular rice, if grains are OK with you and your guests) separately, and omitting it from the recipe, and serving it more like a stew on top of the rice. This might work especially well since the consistency of this recipe is more “stew-like” anyway. Hope that helps, and hope you and your guests like it! I have been using my slow cooker for a short time and I am on the lookout for healthy and deliclious recipes. I think this one fills the bill. I have saved it and hope to make it soon. What is cauliflower rice? I have never heard of it. Thank you for this recipe. Cauliflower rice is just finely chopped cauliflower that is used as a low-carb/grain-free alternative to rice. You can actually now find it in the frozen veggies section of your store, or you can make it yourself by putting cauliflower in a food processor and turning it on until it looks like rice. One search for “cauliflower rice” on Google or Pinterest will give you TONS of info on it- it’s become super trendy in the past couple of years. Hope you like the recipe! This was delicious!!! I wish I’d doubled it! Just added these ingredients to my grocery list! Can’t wait to try. Could you skip the ghee/butter you think? Did you ever try this adding the cauliflower rice at end? I picked up “cauliflower coulettes” which is a bit thicker than rice. Looking forward to this alternative to corned beef and cabbage! You can definitely add the cauliflower rice at the end! Probably about 15-20 minutes before the end of cooking. Actually, I wish I had done that from the beginning since I think it would have held up better. As for the amount of cabbage… it really doesn’t matter much but I’d probably say about 4 cups? The ratio isn’t important for that ingredient. Hope you like it! This was delicious! We served it over rice (rice was separate), though I wish I used the whole cabbage, we have five in our family! Plus, now I have to figure out what to do with half a cabbage. My 16 month old thought it was delicious that same day and the next day, too. Thank you! Never mind! I see your comment above. Congratulations on baby! Hi! I am going to try what you said here and add the cauliflower rice at the end. Do you recco cooking it first? Hi! So sorry for the delayed response- I have a good excuse, I promise! Just had a baby a week and a half ago :-) Hope it’s not too late, but you don’t have to cook it first- it will cook in the slow cooker. Because it’s chopped up so finely, it takes almost no time at all to cook. Could you use the already packaged shredded cabbage, like for coleslaw? I don’t see why not! I chop mine up into bigger pieces than that, but I think it would work. Hope you like it! Do you brown the hamburger? Thank you! Nope! You can just add it directly to the slow cooker- it will cook through in there. Do you add the cauliflower rice to the slow cooker as well? Thanks! If I’m doubling the recipe so that I can have more leftovers, how will that affect cooking time? Shouldn’t affect it at all! Hope you like it! I just tried stuffed cabbage, the traditional way, about a year ago and completely fell in love. However, the prep scared me off. I’m excited to make this easy and quick version. I’ve actually never made real stuffed cabbage before either, for this same reason! But I love the taste, so I made this instead :-) Hope you like it!